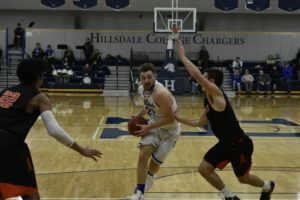 Despite a 19 – 2 run early in the first half, the Hillsdale College Chargers couldn’t hold on to an early lead and lost 75 – 70 to the Uni­versity of Findlay Oilers at home on Sat­urday. 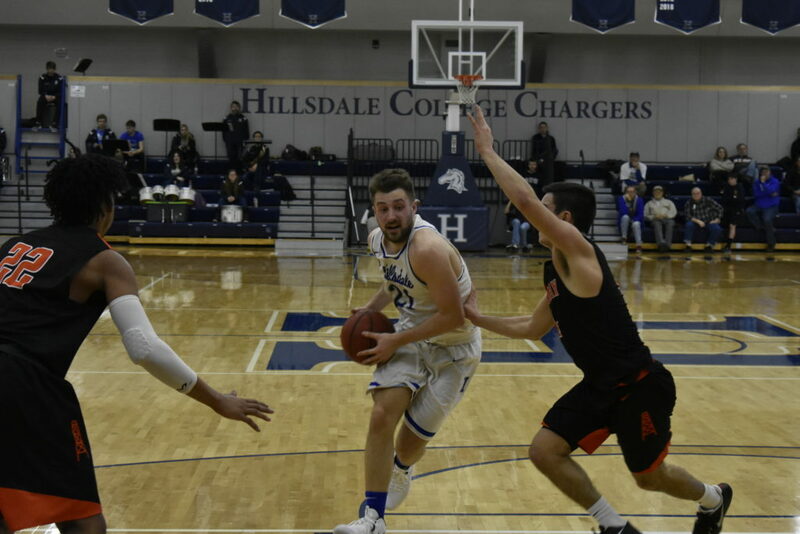 The defeat snapped Hillsdale’s eight-game winning streak, and dropped the Chargers back to second place in the G-MAC, behind first-place Findlay. Hillsdale’s superior field-goal per­centage, fewer turnovers, and well-moving offense couldn’t match Findlay’s repeated trips to the free-throw line. The Oilers went 31 for 42 on free throws, com­pared to the Chargers’ seven for 11 per­for­mance. In a 40-minute game with 41 fouls called, each whistle and each point made a dif­ference. Hillsdale held a 19 – 6 lead with 12 minutes to go in the first half, but the Oilers chipped away and even­tually led 37 – 33 at halftime. Sophomore forward Davis Larson started the second half strong with a quick layup to narrow the gap. His deter­mi­nation under the basket led him to a career-high 26 points. With eight and a half minutes to go, and down 56 – 47, the Chargers had to battle back from their largest deficit. Larson drained a three and drove to the basket for a layup, while sophomore forward Austen Yarian added another layup to bring the Chargers within four, 58 – 54, with six and a half minutes to go. After a crucial three by Hill and a pair of free throws by senior guard Nate Neveau, Hillsdale trailed by only one, 60 – 59. Assistant coach Ryan Choiniere had to pull back ecstatic head coach John Tharp as he jumped and yelled from the half court line. In a crowd of more than 800 people — the largest of the season — Hillsdale’s student section, decked out in white, shared Tharp’s enthu­siasm. Larson gave the Chargers a brief lead at the free throw line with two more points. But on the Oilers’ next pos­session, a costly shooting foul on a three-point attempt gave Findlay three points at the free throw line. The Oilers now led 65 – 61. Hill aggres­sively drove to the basket to draw two more free throws with just over a minute left. Hillsdale was back in the game, 67 – 63, but Oilers went on to score five more points from the charity stripe to secure their lead. With 25 seconds remaining, Findlay led 72 – 63. The Chargers made a last-chance attempt at victory with a three by senior guard Har­rison Niego and a couple of layups by Hill and Yarian, but it wasn’t enough to overcome the Oilers. Larson said the team learned from that game and will work to improve in the remaining five regular-season games. With the win, Findlay (19 – 3) took over the top spot in the G-MAC with a 13 – 2 con­ference record. 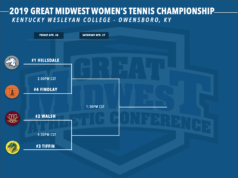 The Chargers fell to second place and are now 16 – 6 overall and 12 – 3 in the G-MAC. Larson played his best game yet in his young career. In addition to his 26 points, he had three assists and four rebounds. Hill came off the bench with tons of energy and aggression to lead the Chargers with four assists and three steals, while adding 12 points. Yarian came off the bench to add 15 points and lead in rebounds with nine. On Sat­urday, the Chargers travel to Painesville, Ohio, to face the Lake Erie College Storm (14 – 8, 9 – 5 G-MAC). Tip-off is at 3 p.m. According to Tharp, this will be a “good Lake Erie team” that has a great defense and a threat­ening scorer. “They have a young man that’s gonna get a lot of shots up and we’ve gotta make sure it’s a low per­centage game for him,” Tharp said. 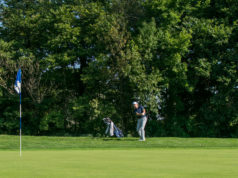 Hill says he and his team­mates are ready to take on the chal­lenge. I hate to com­plain about offi­ci­ating, because it always comes across as sour grapes. But one-sided offi­ci­ating really fac­tored into this bas­ketball game. Findlay had 4 TIMES the number of Free Throw Attempts as the Chargers, 42 FTA for Findlay com­pared to only 11 for Hillsdale. That’s criminal in a match this important for the con­ference lead. Since both teams had similar styles and tactics, there is no way to justify giving that many more FTA to Findlay. They were not that much more effective at avoiding Fouls, the offi­cials must have had the wrong color sun­glasses on. The Chargers came to the basket as much as Findlay, they should have drawn a similar number of FTA-or close to it. Yes, Hillsdale cooled off down the stretch, but by that time the score reflected the dis­parity in FT scoring and obvi­ously impacted the flow of the game. As well as the avail­ability of some Charger per­sonnel due to Per­sonal Foul status. This isn’t Big 10 bas­ketball, so it’s pointless to try and make an issue of a game called in a one-sided way. But the GMAC still keeps the scores and reports the standings-the Con­ference Lead­ership need to evaluate this game and act accord­ingly. There is one official on both the Men’s and Women’s sides who needs to be scru­ti­nized closely for bias and par­ti­sanship. Anyone who watches these games reg­u­larly knows who I’m referring to, so no need to name names.